Similarly to local governments, federations of the urban poor globally are equally concerned about the strong impacts of climate change they continue to experience. Urban poor communities living in global cities believe that COP21 in Paris is an opportunity to state loud and clear that the local communities are major players in finding lasting solutions in the struggle against climate change. Anastasia Wairimu Maina is one of the founders of Muungano wa Wanavijiji, Kenyan Alliance and its National Chairlady since it was formed in 1996. Wairimu was one of the delegates representing Slum Dwellers International (SDI) at the COP21 summit in Paris, views the Climate Summit as "an opportunity to voice up that we, the slum dwellers within the SDI network and beyond are major players in the struggle against climate change." "Cities can make a difference, our collective actions as a network of the urban poor globally ought to be recognized on the international platform of which our achievements may be built onto the climate agenda. This would encourage a more ambitious and inclusive international climate agreement in Paris." Anastasia highlighted how urban poor communities at the local and city levels are directly affected by climate change. "The floods, air pollution by medium and large industries and factories- which directly affects air quality in informal residential areas and settlement-fires. This intimates two things: Climate change is real and is here with us and local governments and authorities cannot address this on their own. In its urban agenda, Kenya’s federation of the urban poor-Muungano wa Wanavijiji has begun to address challenges posed by climate change through awareness creation among the masses. The awareness is built on the Climatic Change Awareness Creation and Adaptation for Improved Livelihoods among urban poor Communities. Another aspect of this awareness is pegged on the Improvement of food security of smaller holder city farmers and food vendors in Kenya’s capital, Nairobi through creating awareness about causes and effects of climate change while motivating them to mitigate and adapt to the changing climatic conditions. Although Climate change and its effects have taken root in most parts of Kenya, the proposed project areas, there is general lack of knowledge by the policy makers, private sector and urban communities about its causes, effects, mitigation and adaptation measures. The consequences of climate change are felt locally, often by slum dwellers living in degraded environments and have to be dealt with at local and city levels. It is therefore crucial that the voices of the urban poor are taken into considerations by and wholly represented to the local authorities be heard at the Climate Summit. Then we can locally and influence change globally," asserts Anastasia . Urban planning and development remains to be an important aspect of rapid urbanization. This therefore makes it important for city authorities to innovate and plan for public spaces in a manner that would incorporate city demands thus enabling city residents to feel part of the city. Public spaces are typically having the mandate of the people to develop, manage and maintain such spaces on behalf of the people. 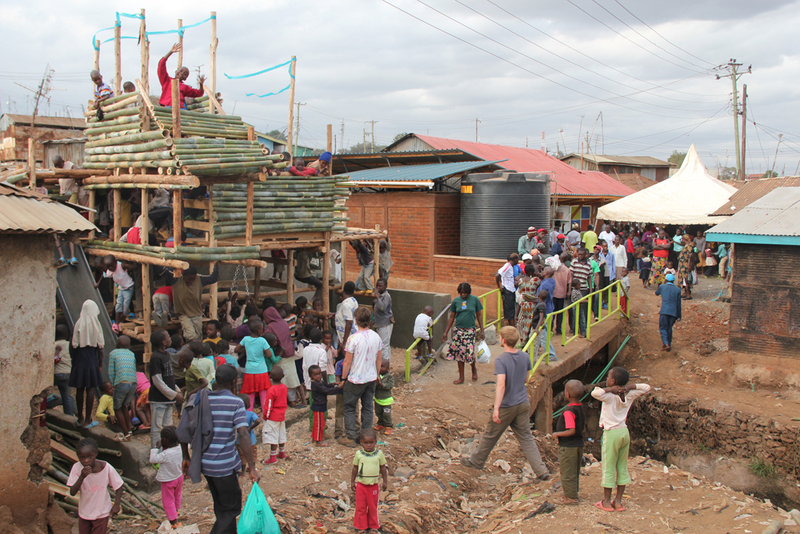 Slum-dwellers play a significant civic role in the utilization and maintenance of public spaces. It is therefore equally important for city authorities to involve urban dwellers to model an inclusive, connected, safe, and accessible city. Public participatory processes give the urban poor the opportunity to help plan and design their city and its public spaces. Cohesion and coordination between members of the Public, community, and civic, charitable and private entities do commonly have different approaches and capacities to safeguard, utilize and improve public spaces. However, it is important to note that such spaces ought to bring all actors on board to enhance better planning, design and maintenance of public spaces. The sustainability of our cities, more so in Africa are enhanced by compact, mixed-use development, and dense centers served by a safe, well-connected network for pedestrians, bicycles and motorized vehicles. Renewable energy and waste recycling systems, native trees and vegetation, clean air, water, soil and sanitary systems all serve to sustain and benefit public spaces. Governments often lead the way in taking ambitious action to mitigate and adapt to climate change. As the level of government closest to the people and the one responsible for actually implementing climate action on the ground, it is essential that they not only be heard, but also help shape the Climate change discussions. The SDI network is calling on national, European and international decision and policy makers to recognize the role and efforts of local urban communities in climate mitigation and adaptation in the Paris agreement and to adapt both financial and legal framework conditions in partnership with local actors.